Nagamachi Samurai Residence (長町武家屋敷跡) is the ruins of Samurai residence of Kaga Domain. Nagamachi was the district where middle to high class of Samurai had their houses. The map of Samurai Houses, roads and canals are exactly the same since Edo Period. The mud walls of this area are reconstructed to create the same sight as it used to be in Edo Period. There are several remaining Samurai houses, such as Nomura House, which are opened for the public. 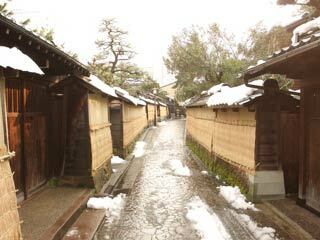 Entire district has the Dobei, the mud wall, and stone floors which offers walking around in Edo period. Also, the gardens in this area take water from Ono Canal which is the same system since Edo Period. ... is the protection for the mud walls. It prevent the wall from icing and snow. It is remaining gate located in Nagamachi. Amano was Samurai with 300 koku which considered they were high-calls of Samurai.